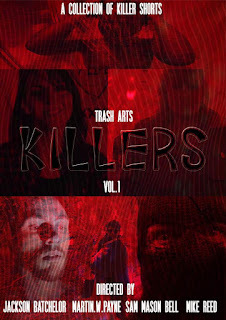 Trash Arts Killers is a creative anthology series showcasing some unique filmmaking techniques and perspectives. It works well, and a majority of the short films are very well done. Some are emotional, some are intense, and others are disturbing, but all are presented in unconventional ways. That all said, an anthology is only as good as its weakest point, so we’ll address that. Court of Conscience, the second short film in the anthology, is the blandest and least creative of the bunch. There’s a distinct lack of buildup and an almost too typical approach to a story that has been done to death. It’s still a decent tribute to B-horror. But an anthology series also has a best part, and the best short film was by and far a great short film. Angel of Decay, however, was the best. The distinct Poughkeepsie Tapes style approach to a serial killer story is great, especially when executed the way Angel of Decay did. It’s an unnerving story that manages to both chill and intrigue, with some shock content along the way. That all said, there was a distinct sense of disorganization in terms of transition and presentation. Some films remain untitled until the end, and others have titles appearing either partway through or during their section. It’s just confusing enough to throw you off for a second, but not enough to ruin your experience throughout. Definitely something that can be improved upon in the future. The use of a short film as a transition is excellent, and I wish more anthologies made use of that. Every short film was made with considerable care and attention. The actors gave very focused performances, the soundtracks suited each short film, the dialogue was good when it was used, and editing was on point. Some films did stray almost too far into experimental territory, but were otherwise good. Overall, Trash Arts Killers: Volume 1 is a great anthology film that will leave you eager for more. I think it’s safe to assume that there’ll be enough positive feedback for a second volume.